Real Deal Retirement » Blog Archive » Can I Invest My Entire Nest Egg In Stocks If I Consider Social Security A Bond? 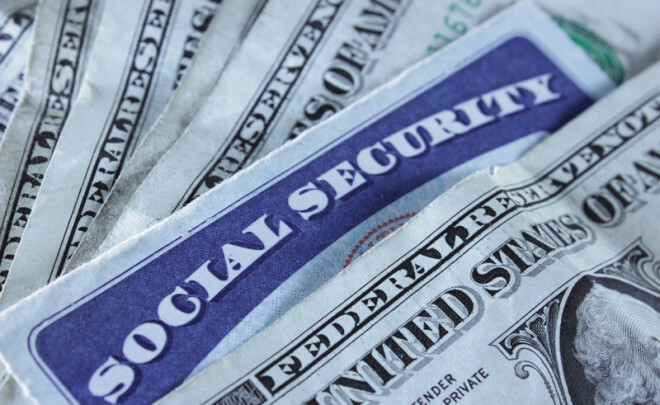 Can I Invest My Entire Nest Egg In Stocks If I Consider Social Security A Bond? My wife and I retired recently and have 100% of our retirement savings in stock index funds. We figure we don’t need bonds because Social Security is essentially a bond. Does that make sense, or are we taking too much risk with our nest egg? I’ll leave it to financial philosophers to debate the dual nature of Social Security. It’s a bond in the sense that it’s an asset that generates regular income, but it’s not in that you can’t sell it as you can a bond. As for whether you should integrate Social Security into your retirement portfolio’s asset mix, however, I’d say it makes sense to consider doing so, but that you may be taking the idea way, way too far in going to 100% stocks. To see why, consider this hypothetical scenario. Let’s assume a 66-year-old married couple earning a bit more than $100,000 a year combined retires and begins taking Social Security. According to Financial Engines’ Social Security Calculator, such a couple might receive joint Social Security benefits of roughly $50,000 a year that would have an expected present value of about $1 million based on their projected life expectancies. Let’s further assume this couple also has $1 million in savings invested in a 50-50 mix of stock and bond index funds and that they require about 85% of pre-retirement their income, or $85,000, to maintain their standard of living. One way to look at their situation would be to say they need income of $85,000 a year, Social Security will provide $50,000 of that, which means they’ll just have to tap their $1 million nest egg for the rest. So if they start with an initial draw of 3.5% of savings, or $35,000, and increase that draw annually by inflation, the couple would receive the combined $85,000 a year they need. And since both Social Security and their savings withdrawals are pegged to inflation, they’ll have a good shot at maintaining their purchasing power. There’s no guarantee they’ll get this inflation-adjusted $85,000-a-year for life, however. The markets could go into a deep funk, inflation could range at some point down the road and maybe they’ll have to dip into their stash to pay expenses they don’t foresee. But if the couple goes to a good retirement income calculator, plugs in their $1 million savings balance and initial 3.5% withdrawal, they should find they’ve got a relatively high chance that their nest egg will last 25 years or longer. But the analysis above neglects the idea that Social Security is also a bond of sorts. So you could say that the couple actually has $2 million in assets—$1 million in stock and bond index funds and a $1 million Social Security “bond.” And if you think of their situation that way, it raises the question of whether this couple is investing too conservatively, and perhaps giving up higher returns and the greater income that could come with holding more stocks. For example, if you consider Social Security a $1 million bond, then the couple effectively has $500,000 in stocks and $1.5 million in bonds ($500,000 in bond index funds plus the $1 million Social Security bond). Viewed this way, the couple has $2 million in assets, of which only 25% is in stocks ($500,000 divided by $2 million), while a whopping 75% is in bonds ($1.5 million divided by $2 million). So if the couple really wants a 50-50 portfolio, one could argue that this couple should sell its $500,000 in bonds and invest the proceeds in stocks, thus putting its entire $1 million nest egg into stocks. That $1 million in stocks plus the $1 million Social Security bond results in a 50% stocks-50% bonds mix. But does having their entire nest egg in stocks really make sense for a 66-year-old retired couple? I suppose it could in a purely theoretical sense. But how would that couple feel seeing the value of their $1 million in retirement savings plummet more than 50% if (or, more likely, when) we have another financial crisis-style market meltdown? Will they derive comfort from the fact that their Social Security bond didn’t take a hit, so they’re not as bad off as they may seem? Maybe. On the other hand, their nest egg is what they’ll be depending on not just for a good portion of their income, but to fund the occasional splurge and cope with unexpected expenses. It’s not as if they can sell off a piece of their Social Security bond if they need additional cash. My advice: Start by completing a risk tolerance questionnaire so you have a realistic idea of what sort of stocks-bonds mix jibes with your appetite for risk. I would use that as the baseline for creating your retirement portfolio. If you then want to bring Social Security into the equation, fine. But be sensible. If your Social Security income, any pension payments, home equity reserve, etc. would be enough to cover most of your expenses even during a prolonged market downturn, then maybe you can afford to tilt that baseline mix more toward stocks. The same goes if your nest egg is so big (or the amount you draw from it so small) that even a huge loss won’t deplete its value during your lifetime. But be sensible. And remember that we tend to become less tolerant of risk at older ages.